In an annual email update, Inkahoots reflected on the ways in which the design collective worked with its various projects. 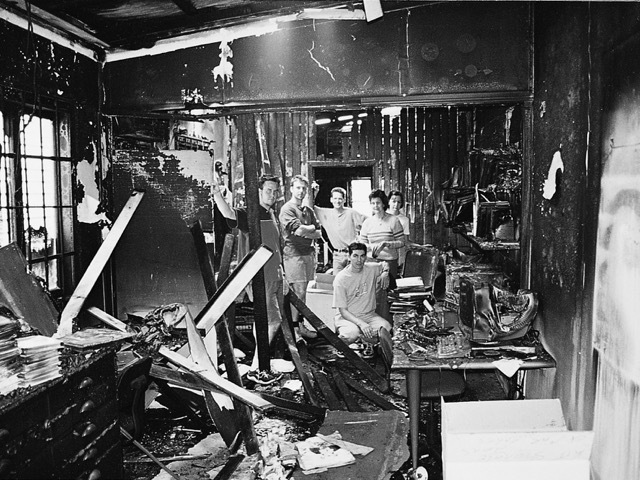 It also reminded us that it was 20 years since Inkahoots’ Boundary Street Studio was burnt to the ground by arsonists. There is a photograph that shows the damage done by this misguided political act (the police suspected far-right activists). It is not often that a design studio is seen as dangerous, particularly one often involved with playful projects, like the new Gallery of Children’s Art presented in their email. Inkahoots demonstrates that creative communication can give voice to social questions that would otherwise be inaccessible in the public domain. Inkahoots confirm that a small studio can be considered a creative political force not only locally, within West End culture, but globally, with international publications such as Eye Magazine or Taschen’s Graphic Design for the 21st Century: 100 of the World’s Best Designers. Certainly there are often simple binaries of left and right that might be used to describe the content of most design publications, however designers such as those who make up the core of Inkahoots have been brought up with European post structural theories through various educational experiences. These are often loosely grouped as Cultural Studies or Critical Theory. One of the most influential methodologies to be found within these disciplines is semiotics. This has proved useful in design education as a way to read images and texts and their connotations. It provided a kind of ideological tool kit that could be used to analyse signs in popular culture texts so that they could be seen/read in various ideological and political ways. Roland Barthes made good use of these methods, but there were plenty others, such as Umberto Eco. As well as deconstructing signifiers and signs, it was then possible for designers to reconstruct signs to shape new “texts”. Subversive deconstructions could be created and recreated, often with a sense of playfulness, like the Memphis group in Italy for example. Some academic books were difficult to relate to for some designers, who preferred the safe harbours of technical proficiency. However, Inkahoots has continued to make confident use of critical theory and unique digital skills and has done so for at least 20 years. Inkahoots still enjoys working as a design studio embedded in their local community but they are among a very small handful of studios internationally whose approach is seasoned with Critical Theory as a key ingredient of their practice. Inkahoots have come a long way since the arson attack some 20 years ago, but they have never stopped thinking about the ethics of their work, and the politics of design practice. Theory has enriched their praxis, without a doubt.